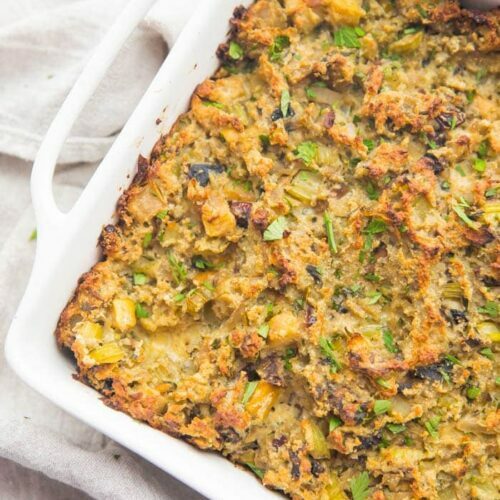 A healthy paleo stuffing recipe that makes the perfect side dish for chicken or turkey. Ideal for Thanksgiving! Gluten and grain free. Heat ghee or oil in a large cast-iron or oven-proof skillet over medium heat. Add onion, celery, apple, mushrooms, cranberries or dates, parsley, poultry seasoning, salt, and pepper. Sauté until very soft, about 7 minutes. Remove from heat. Keep in oven-proof skillet or transfer to 9x9" baking dish. Stir in almond flour and mix well. Add the whisked eggs and stir well. Bake for 45 minutes to 1 hour, or until browned on top. If you don't have a cast-iron skillet, grease a medium-size baking dish before sautéing ingredients (a 9x9" works well). After eggs have been added and the mixture is well-stirred, transfer mixture to baking dish. Continue baking as directed.